Here’s an example of promise and disillusionment from the early Afghan jihad: upper quote below from Abdullah Azzam, lower quote from Mustafa Hamid. I think that we need to hear a lot more from people who leave ISIS – somebody who says, gosh, I joined. I thought I was going to be making the world a better place, and it turned out that it really wasn’t what I imagined, that there were atrocities that I didn’t want to be involved in. There are people who are saying that. We need to amplify those messages. Informing the people of the details of Baitul Maqdis after the night of Me’raaj. The Miraj was the prophet’s night journey to the Noble Sanctuary / Temple Mount (Bait al-Maqdis) in Jerusalem, from whence he ascended the heavens and was given the instructions for Muslim prayer. The Noble Sanctuary was Islam’s first Qibla or direction of focus in prayer. The quote in the lower panel above comes from Mustafa Hamid in his forthcoming book with Leah Farrall, The Arabs at War in Afghanistan. In it, Hamid illustrates both the spiritual aspirations and disappointed hopes at play in that earlier jihad. 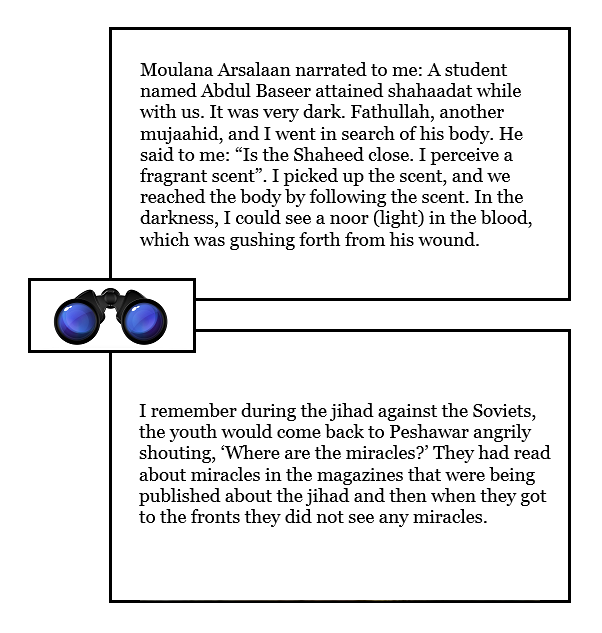 I have discussed Azzam’s and others’ descriptions of miracles previously in such posts as Of war and miracle: the poetics, spirituality and narratives of jihad, Azzam illustrates Levi-Strauss on Mythologiques, and Gaidi Mtaani, the greater scheme of things. Such stories are profoundly moving to those who are open to believing them. In Mustafa Hamid’s words, we see the equal and opposite influence unleashed when such stories, offered as promises in recruitment, prove unsubstantiated by reality. A hat-tip to Myra MacDonald, who pointed me to this quote. Legend tells it that as Teresa was in the choir singing among her sisters one day, she began to levitate. When the other nuns started to whisper and point, Teresa lowered her gaze and realized that she had risen several inches above the stone floor. “Put me down!” she demanded of God. And he did. There’s a deeper truth hidden in St Teresa’s request, I suspect: grace is not taken, it is given. This entry was posted on Saturday, March 21st, 2015 at 4:11 pm	and is filed under al qaida, Charles Cameron, christianity, cve, Doublequotes, Islam, islamist, leah farrall, miracle, Taliban, Uncategorized. You can follow any responses to this entry through the RSS 2.0 feed. Both comments and pings are currently closed.